The romantic name of yesterday today and tomorrow comes from the flowers that open purple, fade to lavender and then white - with all colors present at the same time on this beautiful shrub. 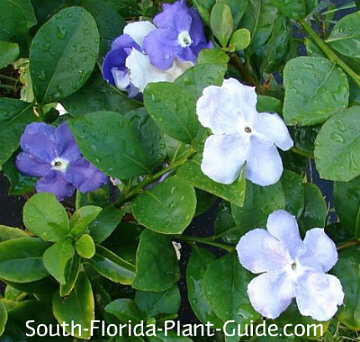 One of the most unusual plants with purple flowers, yesterday today and tomorrow should be used more in South Florida landscaping...not just for its abundant multicolored flowers in rare blue tones, but also because it will bloom even in a partly shaded location. The deep violet, soft lavender and bright white blossoms appear on and off all year, more during warmer weather. 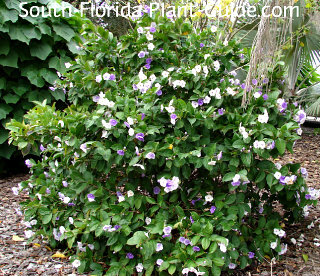 Brunsfelsia contains toxins that, if ingested, affect humans, and, according to the ASPCA, is toxic to dogs, cats and horses. Keep this in mind when choosing a planting location. This shrub grows at a moderate pace and you can keep it about 4 feet tall once it's mature. It will grow in full sun but seems to prefer part sun to part shade. The plant does best in Zone 10 but is moderately cold-hardy, so planting in areas of Zone 9B that border 10A should work. In Zone 9B you might use it as a container plant to bring inside during colder weather. Yesterday today and tomorrow is evergreen but may sustain winter damage, usually coming back in spring. For cooler South Florida areas, plant under a tree canopy or another spot that protects the shrub from frost. Moderately salt-tolerant, these plants are great for coastal gardens. Add a combination of composted cow manure and top soil (or organic peat moss) to the hole when you plant. Trim lightly if needed after a bloom cycle. You can do a slightly harder pruning in spring for size (best after the plant has completed its first spring flowering). Water on a regular basis. This shrub needs a regular drink to thrive. Fertilize 3 times a year - in spring, summer, and autumn - with a good granular fertilizer. You can also supplement feedings with bloom boosters such as bone meal and/or liquid fertilizer. Place these shrubs 3 feet apart. Come out from the house 3 feet. Along a walk or drive, come in 3 or 4 feet to allow room for growth. This plant will work very well in a large container. COMPANION PLANT SUGGESTIONS: Variegated arboricola, crape jasmine, dwarf powderpuff, star jasmine, azalea, tiger grass and heliconia.